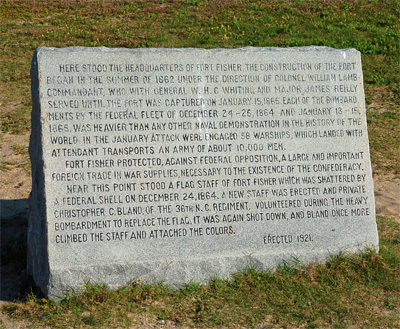 Source: 1921 Fort Fisher Monument, Kure Beach. Image courtesy of the North Carolina Department of Cultural Resources. Photo by Michael C. Hardy. In 1921, this marker was placed on the site of what had been the headquarters at Fort Fisher and subsequently became known as Battle Acre. The marker is a simple rectangular stone slab, most likely granite, that stands approximately three feet tall by four feet wide. The stone was cut and installed such that the front face slants slightly to the back from the base to the top, with the front face being taken up almost entirely with engraving. The marker was placed by the New Hanover County Historical Commission to commemorate the headquarters of the fort which originally stood at roughly that location. The text commemorates the fort's commanders as well as the heroism of the soldiers who kept the Confederate flag flying during heavy bombardment that destroyed one flagpole and shot down the replaced flag twice. The marker is situated at the beginning of the sand path leading to the Fort Fisher Confederate Monument, which was installed by the United Daughters of Confederacy eleven years later in 1932 just to the east of where it sits today. FORT FISHER PROTECTED, AGAINST FEDERAL OPPOSITION, A LARGE AND IMPORTANT / FOREIGN TRADE IN WAR SUPPLIES NECESSARY TO THE EXISTENCE OF THE CONFEDERACY. NEAR THIS POINT STOOD A FLAG STAFF OF FORT FISHER WHICH WAS SHATTERED BY / A FEDERAL SHELL ON DECEMBER 24, 1864. A NEW STAFF WAS ERECTED AND PRIVATE / CHRISTOPHER C. BLAND, OF THE 36TH N. C. REGIMENT, VOLUNTEERED DURING THE HEAVY / BOMBARDMENT TO REPLACE THE FLAG. IT WAS AGAIN SHOT DOWN, AND BLAND ONCE MORE / CLIMBED THE STAFF AND ATTACHED THE COLORS. Construction of Fort Fisher began in 1861, and the fort remained in Confederate control until January 15, 1865 when Union forces captured the fort following an assault beginning on December 24-25, 1864. Fort Fisher was critical for supplying Confederate troops as far north as Richmond with its connection to rail lines. In 1865 Wilmington was the only remaining supply route for the troops in Northern Virginia. Although there is little information about the sponsorship or dedication of the marker, its installation by the New Hanover Historical Commission may be seen as a part of the evolving effort to preserve the fort and its memory and to give it permanent status as an historic site. Colonel William Lamb, who was in charge of building the fort and its commanding officer, tried unsuccessfully following the war and prior to his death in 1909 to achieve preservation of the remains of the fort and site as a national battlefield. In 1931, the U.S. Lighthouse Service transferred Battle Acre to the City of Wilmington with the requirement that it be maintained as the historic site for the fort. A flagpole flying the American flag was installed along with a number of low concrete markers at that time. The flagpole may be a commemorative element connected to the text of the 1921 marker that honors the heroism of soldiers who replaced the flagpole destroyed during heavy bombardment and, in particular, the bravery of a Private Christopher C. Bland. According to the marker, Bland climbed the pole twice after its replacement during heavy bombardment to replace the Confederate flag. The marker is located on Battle Acre Road near Fort Fisher Boulevard South (U.S. 421). It is located on the right side of the highway when traveling south. The engraved front face of the marker faces roughly eastward toward the ocean. The Cape Fear river can be seen in the distance in the background. The marker is located at the center of a sandy path that leads to the 1932 Fort Fisher Confederate Monument located approximately 50 feet behind. The area is grassy with trees marking the perimeter. The entire site, with the 1932 Confederate Monument, has been the location of Confederate Memorial Day observances and other monument ceremonies.